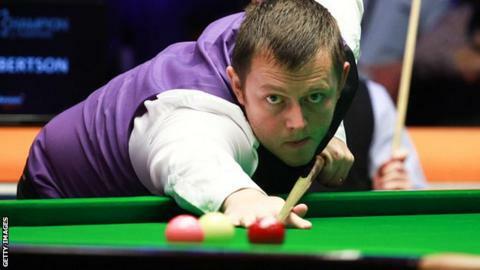 Mark Allen described his 6-2 win over talented Chinese teenager Zhao Xintong in the first round of the UK Championship in York as a "frightening experience". The Antrim man won the first two frames with breaks of 59 and 77 and led 3-1 before a 115 break helped him through. "He is an unbelievable talent and has a bright future if he keeps on that track," Allen said. Fellow Antrim player Jordan Brown lost 6-1 to world champion Stuart Bingham. Allen, who plays Londoner Michael Georgiou in the second round on Sunday, added: "It was frightening experience because no ball was safe". "But I am very happy I got the job done so comfortably. I played alright and used my experience." "He went for a few he shouldn't have gone for and his safety wasn't as good as it should have been, but he is so talented. "I knew he was scoring well, but I knew it wasn't about breaks. If I could keep it tight and make it difficult for him, I always fancied myself to do the job.."
Allen was struggling with a cold but says he will be fine for his second-round match. "One minute I was freezing out there the next minute I was roasting," Allen said. "I was both hot and cold. My head is score, my eyes are sore, my neck is sore but other that that I feel great!" Despite his cold, Allen is happy with his form at start of the second biggest tournament on the snooker calendar. "My form is good on the table, and things have been good off the table for a long time now," Allen added. "I am in a good place and it's starting to show in the results." Allen recently made the final of the Champion of Champions event in Coventry where he lost to world number three Neil Robertson. He added: "I reached the quarter-finals of the International Championship, the semi-finals in Shanghai, I won in Bulgaria and made the final of the Champion of Champions in the last four events. "I have shown good form and it's up to me come here and show it again. Everything has clicked in the last couple of months. I want to start doing better in the big events but whatever happens, happens."